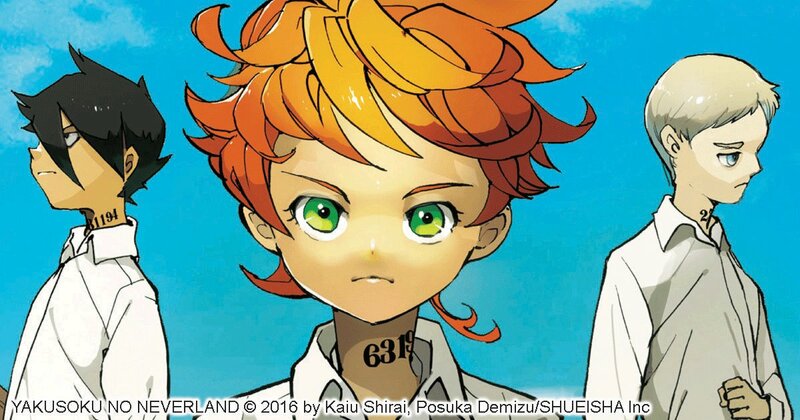 One of 2017’s best series — for my money, anyway — was The Promised Neverland, a Shonen Jump title about a group of orphans who discover their home is, in fact, a human farm. The manga has attracted a strong following on both sides of the Pacific, selling a respectable 2.1 million copies since its 2016 debut in Japan. The latest issue of Weekly Shonen Jump revealed that CloverWorks is adapting the manga into an animated series, though no personnel or release date for the project has been confirmed. The timing of this announcement is not surprising, given comments made by Neverland’s supervising editor in February. “The manga entered a new arc, and the serialization and story reached its turnaround point,” he observed. “From now on, as the story races at full speed to the end, I would be happy if you continue to watch over these kids as they learn the truth of the world and meet their destinies.” Stay tuned for more details. 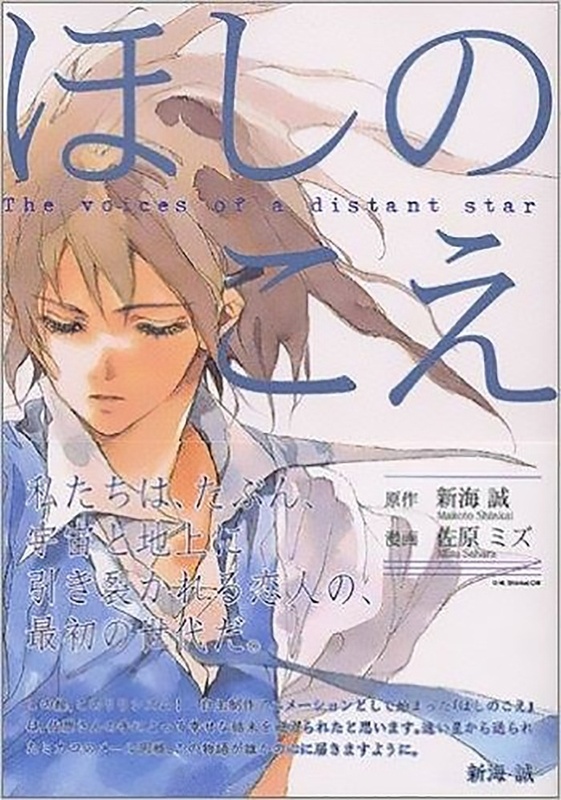 Big news from Vertical Comics: the publisher just announced that it will be issuing a new edition of The Voices of a Distant Star, a single-volume adaptation of Makoto Shinkai’s 2002 OVA. 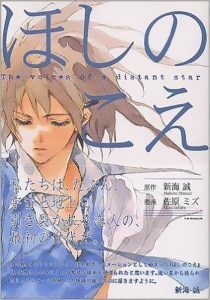 First released by Tokyopop in 2006, Voices focuses on a pair of lovers who are separated by distance — in this case, vast distance, as the heroine is on a mission to defend Earth from aliens. The story unfolds primarily through the couple’s messages, which take longer and longer to reach their respective destinations. If it sounds like a downer, it is, but the poignancy of the characters’ situation and the beauty of Mizu Sahara’s illustrations make the pain worthwhile. Vertical also revealed plans to publish Hikari Nakamura’s Arakawa Under the Bridge, Tomofumi Ogasawara’s Gundam Wing: The Glory of Losers, and Keiichi Arawi’s Helvetica Standard, a companion series to Nichijou (My Ordinary Life). Support manga, support your library! Arisa, Volumes 5-7 by Natsumi Ando. As ridiculous and unbelievable as Arisa can be, I’ll have to admit that I actually am rather enjoying the series. The number of plot twists that Ando works into the manga is astounding. I know that they’re coming, but I have no idea where Arisa is going. I’ve learned not to stress out about it and just sit back and enjoy the absurdity as it develops. However, I can’t help but wonder where all the adults are in all of this. Occasionally a teacher, parent, or guardian is seen, but none of them seem very involved in the students’ lives at all. But then again, that might be part of the point of the series. The students in class 2-B have issues (they have a lot of issues) and King Time began in part because their needs and concerns weren’t being addressed elsewhere. More and more of their secrets are being revealed, but I’m not sure we’re any closer to actually learning who the King really is. Arisa continues along its dark and twisted path and I can’t help but be oddly mesmerized by the whole thing. Cowa! by Akira Toriyama. Cowa! had completely slipped under my radar until just recently. It’s a shame that I didn’t read it sooner because it is a terrific and highly enjoyable manga appropriate for kids as well as adults. The first few chapters are fairly episodic and start out with Paifu, a young half-vampire/half-werekoala, and his best friend and ghost José Rodriguez getting into all sorts of trouble. But then the manga develops a continuing story–Paifu’s hometown of Batwing Ridge is suffering from an epidemic of the Monster Flu. It’s up to Paifu, José, their not exactly friend Apron, and Maruyama, a grumpy ex-sumo wrestler, to save the day. Together they travel in search of the cure and it ends up becoming quite an adventure. There’s action and danger, bad guys and monsters. The interactions between Maruyama and the youngsters are simply marvelous. The manga is a lot of fun and funny, too. It may be silly at times, but it’s also heartwarming and has a good message. Cowa! is an absolute delight and definitely worth a look. Slam Dunk, Volumes 7-10 by Takehiko Inoue. I am a huge fan of Inoue’s manga. While Slam Dunk isn’t my favorite of his series, I still find it to be a great manga. 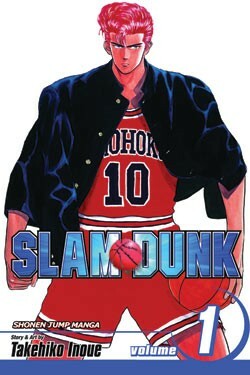 Slam Dunk was Inoue’s breakthrough work and is immensely popular and influential. The basketball games in Slam Dunk are extremely well done, but so far what appeals most to me about the series is the characters. I particularly enjoy all of the delinquents that show up in the series and on Shohoku’s basketball team. The guys are just as capable in a fist fight as they are on the court. Granted, Sakuragi still has a lot to learn about basketball. He has some natural ability and potential, but I’m not sure anyone has actually taken the time to explain all the rules to him. Realistically, this is somewhat unbelievable, but it does provide a certain amount of humor. In general, Slam Dunk is much more comedic than Inoue’s other manga available in English. However, there’s still some seriousness and plenty of heartfelt passion in the series, too. Time Lag written by Shinobu Gotoh and illustrated by Hotaru Odagiri. I didn’t realize it at first, but Odagiri is also the artist for Only the Ring Finger Knows, which I quite enjoyed. Time Lag is a slightly older work, and not quite as memorable, but still enjoyable and rather sweet. Satoru and Shirou used to be very close growing up, but after junior high they’ve grown apart despite Satoru repeatedly professing his love for the other young man. Satoru can’t seem to figure out what went wrong, but when a letter from Shirou arrives three years late he may have one last chance at setting things right. However, complicating matters even further is a love-triangle involving Seichii, another classmate. Plots that revolve around a giant misunderstanding often annoy me, but in the case of Time Lag I think it was handled very well. Some of the smaller misunderstandings were still frustrating, though. Granted, those deliberately created by Seichii and his jealousy make a fair amount of sense in the context of the story and the resulting drama is understandable. With each new volume of Slam Dunk I’m simultaneously happy and a bit disappointed – happy because I can read another volume of a great sports manga, and disappointed because we are slowly inching towards the final 31st volume. I continue to find Slam Dunk fascinating even when a basketball game gets spread out over several volumes. Shohoku is still playing tournament favorite Sannoh, but things finally start to click for the loveable underdogs. My favorite aspect of this volume was that the breakout star of the game wasn’t the cool Rukawa or the sometimes doltish basketball savant Sakuragi, but their sometimes overlooked and quiet teammate Mitsui who starts out the volume by hitting three 3-pointers in a row. He’s able to take advantage of the fact that Sannoh’s focus is on Shohoku’s star players and score with simple precision. Everybody is mystified by Mitsui’s sudden confidence, including his own teammates. The Shohoku fans remember that Mitsui used to be a junior high MVP, but his play has suffered because he felt like he had to live up to some past glories. Shohoku’s enigmatic coach concludes that Mitsui is starting to believe in himself again at just the right time, and there’s a great wordless interchange between coach and player as they make eye contact and pump their fists. Simple moments like this where Inoue just uses a few simple panels to underscore a moment do so much more to drive the story forward than pages filled with expository dialogue. Once the opposing team realizes that Mitsui needs more coverage, Shohoku needs to change up their strategy yet again. Rukawa and Sakuragi both have some moments, but Sakuragi is tested when the opposing team puts a huge substitute player in and his coach tells him that the monster is his assignment. It is a measure of just how far Sakuragi has come that while he does give in to his first impulse of trying to fight strength with strength, he eventually hits on a way to deal with the new player using strategy and observation. Each volume of Slam Dunk always feels very satisfying. To describe the plot, it might seam as if the story is moving forward at a glacial pace, with three volumes or so spent on one basketball game. But the evolution of characters and personalities brought on by the conflict of basketball is layered and dense, and that makes this title such a special sports manga. This week, Melinda, Kate, David, & Michelle take a look at seven ongoing series from Viz Media and Yen Press. 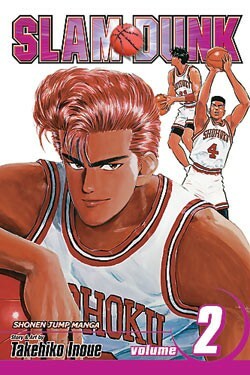 Red-haired tough guy Hanamichi Sakuragi just can’t get a girl. 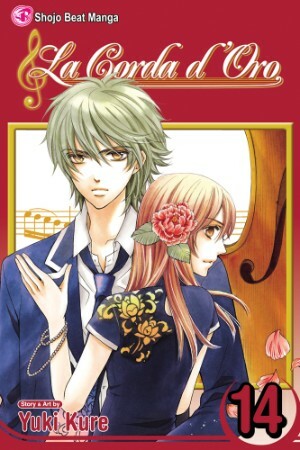 After a string of rejections in junior high, he finally meets pretty Haruko on his first day of high school. Trouble is, Haruko already has a huge crush on a junior high basketball star who has also enrolled at their school! Determined to win Haruko’s heart, Hanamichi decides to join the basketball team. He’s a huge, strong guy with a lot of natural ability. Unfortunately, he’s also brash, self-involved, and utterly lacking in maturity or emotional boundaries. Can Hanamichi ever learn to be a team player? On one hand, Slam Dunk is an extreme example of a typical shonen sports manga, with its overblown characters, outrageous rivalries, and intense focus on winning. On the other, it is a fresh, lighthearted look at a guy who just can’t seem to catch a break, despite a level of optimism previously unknown to mankind. It’s not that Hanamichi never wins, of course. The guy can’t lose in a fight, and he even manages to win (sort of) against Haruko’s brother Akagi (who also happens to be the captain of the basketball team) in an epic game of one-on-one. What he can’t win, no matter how he tries, is the girl, and it’s somehow refreshing to meet a shonen sports hero whose real focus is far, far from the game. Also, while Hanamichi’s myopic pig-headedness makes him generally insufferable, it’s also the key to his charm. There’s a scene in the second volume, for instance, in which the captain of the school’s judo team attempts to lure Hanamichi away from basketball by offering him some photographs of Haruko in exchange. After a series of conversations consisting basically of, “So, will you join the team?” “No.” “But don’t you want the photos?” “I do!” it finally becomes clear that Hanamichi intends to refuse the captain’s offer and simply take the photos by force. Though the scene does nothing to improve Hanamichi’s image as a hopeless brute, it is surprisingly satisfying to see the judo captain’s tired scheme dismissed so easily. Another strength of the series is its supporting characters. Though Hanamichi’s strong and silent love rival, Rukawa, is barely seen in these early volumes, basketball captain Akagi is already a powerful character. 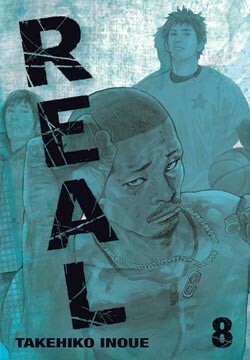 Mature enough to separate his personal dislike of Hanamichi from his responsibilities as captain, he displays the beginnings of the kind of depth and nuance found in Inoue’s later seinen series, Real. Also notable is the basketball team’s manager, Ayako, who is very much welcome as a confident, athletic, female presence on the testosterone-heavy court. Inoue’s art is similarly refreshing, with a clean, easy-to-follow quality too rare in shonen manga. The artwork is quite expressive as well, revealing a real investment in the characters and a genuine love of the game. Though the real action gets a slow start in favor of important characterization (and some less impressive class hi-jinx), Slam Dunk shows its potential right from the beginning. Just two volumes in, it’s not difficult to see why it’s a popular series on both sides of the Pacific. Recommended. 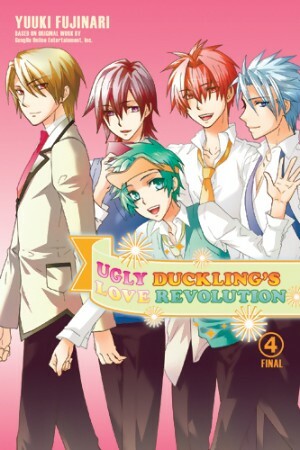 This review is a part of Shonen Sundays, a collaborative project with Michelle Smith. Tomomi Nomiya is a high school dropout, consumed by guilt over his involvement in a motorcycle accident that leaves a young woman without the use of her legs. Kiyoharu Togawa is a former junior high runner whose struggle with bone cancer costs him his right leg below the knee. Hisanobu Takahashi is a high school basketball hotshot who becomes paralyzed from the chest down after colliding with a truck while riding a stolen bicycle. What these three teens all have in common is a passion for basketball. It’s not quite fair to compare this series to Takehiko Inoue’s earlier basketball series, Slam Dunk. After all, Slam Dunk is written for young boys, and Real for adults. Still, with both series being released concurrently in English, its difficult to resist. Though Slam Dunk contains the seeds of a great basketball manga, it is through Real that Inoue is able to express not only his real love of the game, but his real insight into the human condition. The main action of the series revolves around the Tigers, a wheelchair basketball team with which Togawa maintains a fairly tormented relationship over the course of the series’ early volumes. It’s this team that brings Togawa and Nomiya together to begin with (in a sort of roundabout way). And though Takahashi has (as of volume eight) still just barely begun rehabilitation that might make it possible for him to one day participate in wheelchair basketball, it feels inevitable that he’ll end up there at some point. 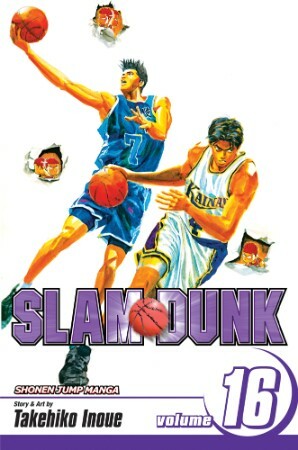 The basketball scenes in this series are intense, in a very different way from the super-fueled play in Slam Dunk, and entirely gripping even for non-fans of the game. What’s most impressive about this series, however, is Inoue’s ability to get inside his characters’ heads and transform their thoughts and feelings into compelling narrative. 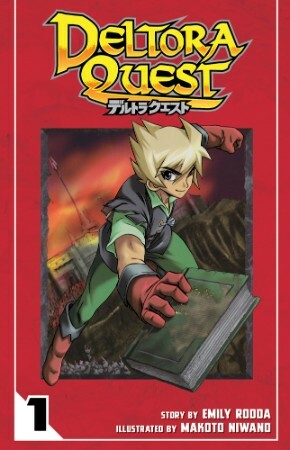 Enormous chunks of the later volumes, for instance, involve Takahashi’s bitterness over his father leaving him as a child, torment over his current condition, and his inability to adjust to his new body. Inoue not only brings Takahashi’s memories to life with a series of powerful flashbacks, he also focuses heavily on Takahashi’s grueling rehabilitation process, with a level of realism that kicks your average training montage squarely in the behind. Yet, through all this, Inoue deftly steers clear of allowing his story become mired in its own weight. Even the series’ heaviest sequences are a true pleasure to read. Inoue’s artwork in this series is impressively mature. 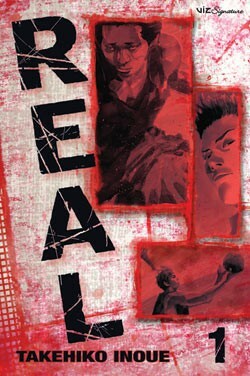 Without the attractive sheen of Slam Dunk‘s shonen sensibility, the world of Real is unpolished and gritty. Inoue’s early expressiveness is even more pronounced in this series, and much more detailed. Also, despite some great dialogue, Inoue lets his artwork do the bulk of the storytelling. Important moments are played out visually, panel-to-panel, without the need for any narration or extraneous dialogue to pick up the slack. Review copies of vols. 5-8 provided by the publisher.